Hajipur (Bihar) : At least six people were killed and 38 others injured when 11 coaches of the New Delhi-bound Seemanchal Express derailed before dawn on Sunday in a rural part of Bihar’s Vaishali district, authorities said. A technical fault was blamed for the disaster that took place close to 4 a.m. near the Shahadai Bujurg railway station, jolting passengers out of their sleep and causing widespread confusion and panic in the darkness. All the dead have been identified, the railways said. Twenty-two of the injured were admitted in the Sadar Hospital at Hajipur. Eight grievously injured passengers were referred to the Patna Medical College and Hospital. Another passenger, Anita Devi, said she suddenly started heard the cries of other people who had apparently been injured. “I feared that I was about to die but luckily I survived,” she said. Mantosh Mandal, who sustained slight injuries in the leg, said he heard many taking the name of god in pain and fear. According to officials, three of the 11 derailed coaches were damaged. The train plies between Jogbani in Bihar and Anand Vihar in New Delhi. The prima facie cause of the accident was said to be a fracture on the rail track. 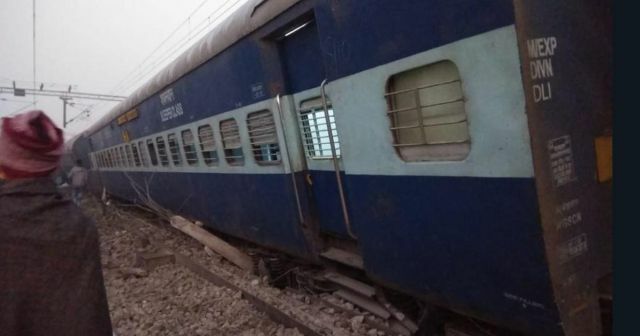 East Central Railway (ECR) spokesperson Rajesh Kumar said the train resumed its journey for Delhi at 9.50 a.m. with about 1,500 passengers from the derailed coaches adjusted in the front 12 coaches. An additional 11 coaches were added at Danapur near Patna. The accident forced the railways to cancel 10 trains and divert eight on other routes. Railway Ministry spokesperson Smita Vats Sharma told IANS that three teams of the National Disaster Response Force (NDRF) carried out rescue and relief operations and an inquiry had been ordered into the cause of the derailment. The inquiry will be carried out by Commissioner Rail Safety (Eastern Circle) Latif Khan. Railway Minister Piyush Goyal announced an ex-gratia of Rs 5 lakh to the kin of those who died, Rs 1 lakh to the grievously injured and Rs 50,000 to those who suffered simple injuries. “All medical expenses will be born by the railways,” his office said. The Bihar government has also announced ex-gratia of Rs 4 lakh to the kin of the dead. The first to reach the accident site were villagers who began taking out the injured out of the derailed coaches. Some of them became angry over the delayed arrival of relief and rescue teams and what was described as the apathy of the railway and local officials. When some security personnel reportedly misbehaved with the villagers, it led to stone pelting by them.